Bishops Gate Hotel officially opened for service on Friday 4th March 2016 but the building which the hotel occupies has a much longer history. Originally built in the 1800’s as 2 grand townhouses the building was purchased in 1899 by the private members club known as the Northern Counties Club. The club featured members of the local gentry and military and owned bases in several locations around the UK and further afield. Today there are 60 clubs around the world including 12 in London, details of locations can be found here on the club’s website. Derry’s Club was formed in 1880 by local residents who had served during the Crimean War. Originally meeting in No. 3 St. Columb’s Court the popularity of the club necessitated the purchase of larger premises and so at the end of the 19th Century our building was acquired for £1200. Renowned architect Alfred A Forman was responsible for remodelling the building and the club then opened its doors in 1902. During renovations of the building our team were able to speak with Mr Forman’s descendent Ann Fraser Forman Brown who helped to expand our knowledge of Mr Brown’s history and work within the city such as private residence in Clooney Park East which was designed in 1896 and features hipped gables, half-timber work & bay windows, many of these became Mr Forman’s signature style and can be seen in multiple properties which he created. Unfortunately, Ms Fraser Forman Brown is unable to travel to Ireland to see her ancestors work but her son recently visited the area, taking time to see our hotel and other buildings designed by Mr Forman. The panelling which features on our grand staircase & our Northern Counties Ballroom along with the stained-glass windows and ornate fireplaces are all original to Mr Forman’s plans and have been sensitively restored during the restoration process. 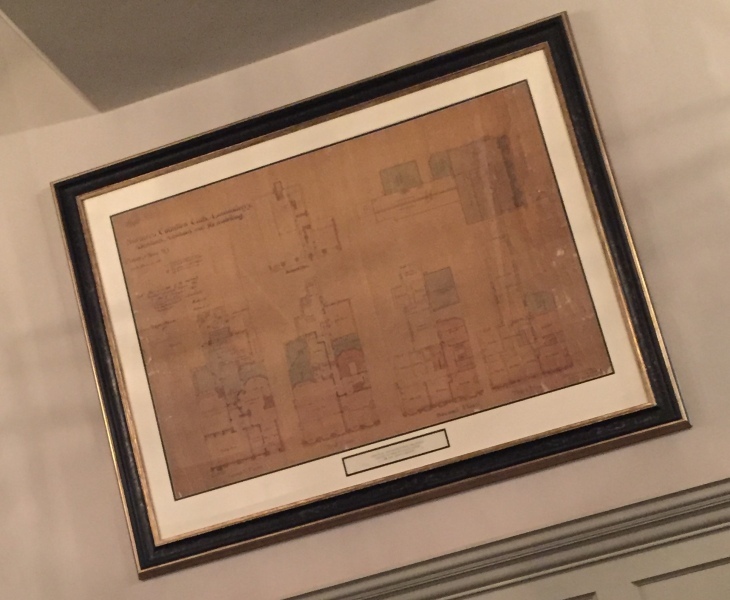 The original drawings created by Mr Forman of our building now hang proudly in our Wig Bar, having been gifted to the hotel for public display on 24th December 2015 by Mr Tony Crowe. One of the Northern Counties club’s taglines is “A Place to Meet, Eat & Stay” and so the club renovations ensured these needs were met by creating catering & accommodation facilities, a library and billiards room for entertainment. Our Wig Lounge was the original club library, 3 arched alcoves remain which were the original location of the library bookshelves. In our Wig Lounge, we have placed some photographs of Northern Counties Club members playing at their billiards table, have a look during your next visit and let our team know if you recognise any of the players. Throughout the years of use by the Northern Counties Club there have been many famous visitors – including Winston Churchill, W.B. Yeats, Field Marshalls Montgomery and Alexander and artist Derek Hill. At the hotel main entrance is our revolving door entrance, whilst not original to the building it is believed to be almost 100 years old and has its own interesting history. Whilst the building was home to the Northern Counties Club it was inaccessible to members of the public, the clubs’ doorman always keeping a watchful eye to ensure no members entered through this door. Some residents have told us that in their youth it was a well-known local dare for school children to get in through the revolving door, on to the grand staircase and back out before being caught by the doorman. The clubs’ billiard room and bar have now been transformed to become our Wig Lounge & Bar, along with The Gown Restaurant our Food & Beverage areas have been named in reference to our neighbours at the courthouse, many of whom may have been members of the Northern Counties Club, many of our pieces of art throughout the hotel tie in with this legal theme, our canine artwork has become a popular talking point amongst guest and features on visitor Facebook & Instagram posts often. Other pieces of art reference our local area which photographs showing the shirt factories which were common in the city, Bishop Street Gaol & other streets close by, some of which are no longer present also feature. On the second floor of our hotel is The Hervey Library, home to our Afternoon Tea service which has proven to be very popular both with local residents & hotel guests. Named after Bishop Frederick Hervey who was was often called “The Earl Bishop” as he was from an aristocratic family background. Bishop Hervey invested heavily in the development of both the city and North-West area – The Bishop was happy to invest in the city to help develop roads and buildings. He was a great lover of reading and designed and constructed the beautiful Mussenden Temple near Magilligan to be his own private library. Through sympathetic restoration of the original and adjoining buildings, this unique venue which is now Bishop’s Gate Hotel, retains its character, period charms and its historic splendour. With the utmost care and attention, the building has been redeveloped and restored to continue its celebrated legacy well into the 21st Century and for generations to come, providing a place to meet, eat and sleep.